We are pleased to announce the expansion of Njardarheimr. • The main objective of Stage II is to put in place all the necessary facilities and infrastructure that will allow Njardarheimr to be open all year round. • Stage II includes more than 1000m2 of new building work. • The total cost for Stage II is about 20 million NOK. • Entrance next to the E-16. 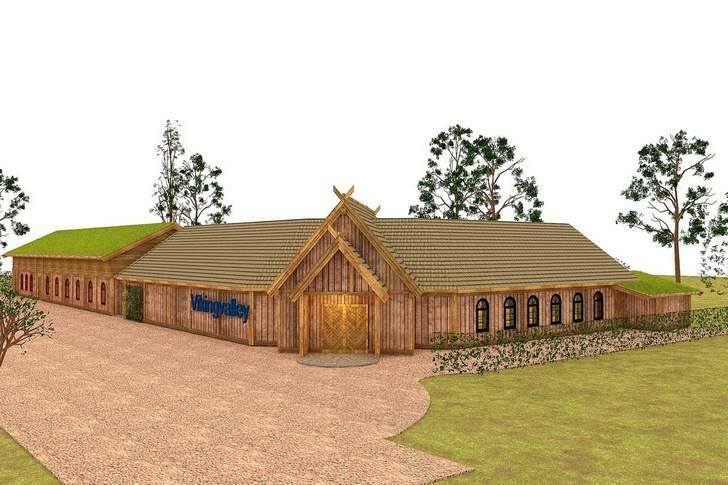 Shop & service buildings, as well as retail space and toilets, containing necessary features for visitors, employees and vikings. • Multipurpose hall for all types of events. • Food hall and associated buildings. • Large Blacksmith workshop adapted for historical production and course activities. • Palisades and greenery around the city where this is missing. • Various smaller works on existing building stock. • Njardarheimr opened on May 31, 2017. • Njardarheimr had over 14,000 visitors in the 2017 season. • In future building stages, a 36-meter-long Gilde hall is planned. • The completed development of Njardarheimr will consist of about 40 buildings. Any enquiries regarding Njardarheimr should be addressed directly to the CEO.